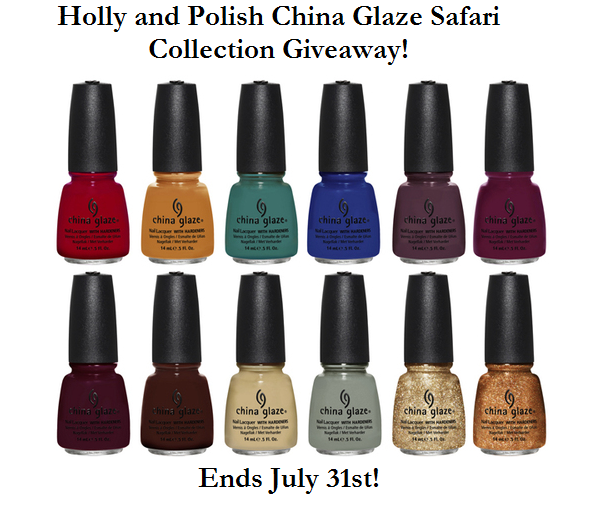 Holly and Polish: A Nail Polish and Beauty Blog: China Glaze On Safari Collection Giveaway! This Wednesday will be exactly one year since I started Holly and Polish! In order to celebrate, I am hosting a giveaway where one of my followers will win the entire China Glaze Fall 2012 Collection, On Safari! I posted about this a couple of weeks ago, but there are still a ton of you who have not participated! This collection is awesome, so I'd really encourage you all to enter!